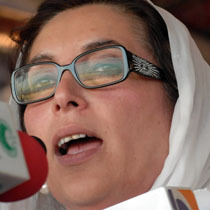 On the surface it would seem that the assassination of Benazir Bhutto, as she campaigned to regain power from the militarist Pervez Musharraf, should have meaning in the Caribbean beyond the mere death of a world leader in a country on the front-lines of one theatre of the “War on terror”. Approximately half of the populations of Trinidad and Tobago and Guyana are from the Indian subcontinent. Significant numbers of Surinamese also trace their ancestry to that region. A tiny fraction of Jamaicans, Grenadians and St Lucians also descend from people who came to the Caribbean after the abolition of slavery as indentured workers. While migration from India, including regions which would become Pakistan after the 1947 separation, continued into the 20th Century, the majority of the arrivants would have left before developing any strong nationalist sentiments on the partition. A more recent influx of Punjabis to places like Barbados has brought more of their religious rather than nationalist tendencies, and they are more intent on setting up commercial rather than political roots. In Trinidad and Guyana, there is more religious harmony between Hindus and Muslims of South Asian extraction than between them as a group and the other large ethnicity, African Guyanese and Trinidadians. One is more likely to find Indo-Guyanese or Trinidadians politically aligned in a party than with non-Indians. While in 1990 Trinidad had an encounter with an Islamic insurrection, the leader, Yasin Abu Bakr, and most of his rebel followers, were Muslim converts of African extraction. Abu Bakr’s Jamaat al Muslimeen did not have the support of the country’s largest Muslim organization the indo-based Anjuman Sunnat ul Jamaat Association. Back in 1991, Guyana’s Islamic Trust leadership was reporting a dwindling of participation in the organization’s activities. The moderate politics of Benazir Bhutto would possibly square with that of any of the democracies of the region – her warts of alleged corruption and all. But she had no close ties to the region, save for membership in the Commonwealth club where some of the Anglophone prime ministers would have met her at one of their summits, if her tenures coincided with one. The impact of her slaying may result in a consolidation of the grip on power held by Musharraf who is without one of his main opponents in the scheduled January 8, 2008 election. Her death may well ease a headache of Washington, which has one fewer major actor to deal with in its Pakistan staging ground against Al Qaeda. But it will not shorten the war, which continues to contribute to skyrocketing oil prices which numb the growth prospects of economies such as those in the Caribbean.